The following was an article I wrote for the AWGB Revolutions Magazine a couple of years ago. The method described is much the same as the method I use now. IT would take far more space than is available to give full instructions on how to make Chinese Balls. This article is about my journey so far and hopefully will help anyone get the information available from others far more experienced in making these interesting turnings than me. Travelling to another wood turning club (Strathclyde Woodturners), a journey of some 40 miles my travelling companion handed me David Springett’s book “WoodTurning Wizardry” To look at. He had been given it for Christmas and being a fairly inexperienced turner found if way beyond him. Always looking for something different to turn, l decided that l would like to try some of the turnings. David makes much of using boxwood for these items, l must state that l have an aversion to buying wood for turning, however I decided on this occasion To bite The bullet and buy some Boxwood. Looking at The various wood suppliers sites l could not ﬁnd any more than 50mm diameter. So I Then went to The old favourite fleabay and found some small logs There. L placed bids on l or 2 but being a bit mean did not bid high enough. I decided that I would try it with some beech and cherry which I have had in my wood store for 7 or 8 years. They had been cut into smaller pieces about 5 years ago. The ends were well sealed and stored in a dry place with plenty of air round about them so they were probably as dry as anything I could buy. I sent for The Crown ‘Springett’ Chinese Boll Tool Set and while I was waiting for it to arrive I turned some spheres as close To 2 1/2″ inches I could. I then marked out the spheres according To David’s book and Then made a sphere holding jig. I went straight into a full 5 piece Chinese Ball following the instructions. The ball kept turning in the jig. I stuck sandpaper to the inside of the jig and started again. I drilled the ﬁrst hole in the end grain and reamed it out using The Crown Tool. Using The longest cutter, I carefully cut to the end of the groove with each of the cutters and put a hardwood plug in that I had previously made, carefully marking it as instructed and turned The ball round to the opposite end grain. I went through the same procedure and then started on the other holes. This is where the problems arose. When cutting the groove, once the cutter reached the plug the different density caused the cutter to catch and the ball turned in the jig. I persevered for a while, and then discovered that because my sphere was not exactly 2 1/2″ diameter, the holes mode by The Crown Tool were too big and the space between them was so narrow in places that it was breaking away. I almost gave up of this point but by this time I had the bit between my teeth and was determined to master the technique. I searched the internet for some more information and found Magical Wood Products at magicaIwoodproducts.com. Here Joe Skehan has started to document some information about making these balls. Unfortunately he has only got one of the tutorials on the web site but it is the most important one “Making a 1 Level Ball“. To save going back to my school trigonometry I blatantly stole The calculations already done by people like David Springett, Joe Skehan and Claude Lethiecq. I am now used to working in metric measurements so the sphere used will be 63.5mm diameter. When I ﬁnish off the outer end of the sphere I will mark that end with my drive centre to give me a starting point for marking out the hole centres. For 6 holes I multiplied the diameter of 63.5 by 0.707 = 49mm and for I2 holes I multiplied the diameter of 63.5 by 0.526 = 33.4mm. I followed Joe Skehan’s instructions for making a single level ball and found that fairly simple. I practised it using different types of wood and became reasonably proﬁcient. Joe did not have the tutorials for the next stage on his web site so it was back To Google to ﬁnd some more information. I found http://www.morewoodturningmagazine.com/magazine.php. This magazine is edited by Fred Holder and he has written a book ‘Making the Chinese Ball’ or ‘Five Concentric Spheres’ which is available To download in PDF format. In his book, Fred shows how to make a sphere chuck from plumbers fittings. Unfortunately the ﬁttings used in US are different from UK. He uses 2” and 3” fittings. Ours go from 1 1/2“ to 4”. I have mode a couple of chucks from 4 inch compression fittings but ﬁnd that they are difficult To Tighten sufficiently. I drilled holes and dug out The Tools Tor Tightening my old Multistar chuck. This worked for a little while, but after some Time the Threads must have worn and the ball started slipping. I went back to using the chuck with the four screws and a long Phillips screwdriver To Tighten or slacken them. I have continued using This Type of chuck except that l now use on electric screwdriver with a long extension bit. To prevent the ball slipping, l Tried sticking sandpaper inside the chuck, as advocated by David Springett. I did not ﬁnd this helped much. I then tried spraying contact adhesive inside and letting it dry. However l now squeeze hot melt glue inside and spread it round with a curved scraper. Every so often just remove it with a round nosed scraper and start again. I made 12 hardwood plugs to fit the holes but had a problem getting a really tight fit so I melted some wax and coated the plugs with it and this gave me a good fit. That was ﬁne on the first two holes but when cutting from the next hole the tool caught one of the plugs and this then moved the ball in the chuck no matter how tightly l had it held. Fred in his book advocated machine wax. I got some, made moulds the same size as the holes in the ball and made wax plugs. This worked better but machine wax is either bright blue or bright green and the dye from it makes a mess of the ball. It is then a lot of work cleaning the inside balls. I now make plugs from softwood (a pine broom handle). It is not easy making plugs to get a perfect fit. In each of the holes so there are a couple of methods l use to get the plugs to fit. One is to use a little hot melt glue to stick the plug to the outside ball which is the easiest one to clean. The other is to melt paraffin wax and coat the plugs with it then when ﬁtting the plug, dip it into more hot wax to build up a thickness and push it into the hole. The wax hardens quickly and holds the plug in place. Using softwood, l ﬁnd that when the tool hits the plug it cuts through with no problem at all and does not move the ball. I made some 2 and 3 stage balls then went on to other shapes inside the ball. I have now successfully made a number of 4 level balls. I found that l needed a handle for each of the cutters so that l could complete the undercutting in each hole without having to change the cutter. This made the creation of these balls so much easier. I have not managed to successfully make a ﬁve level ball and since I have been working up to this I still use forstner bits to drill the holes. I have cut Perspex discs and glued them to the bits to create depth gauges and it ls a simple matter to change the bit using a keyless chuck in the tailstock. 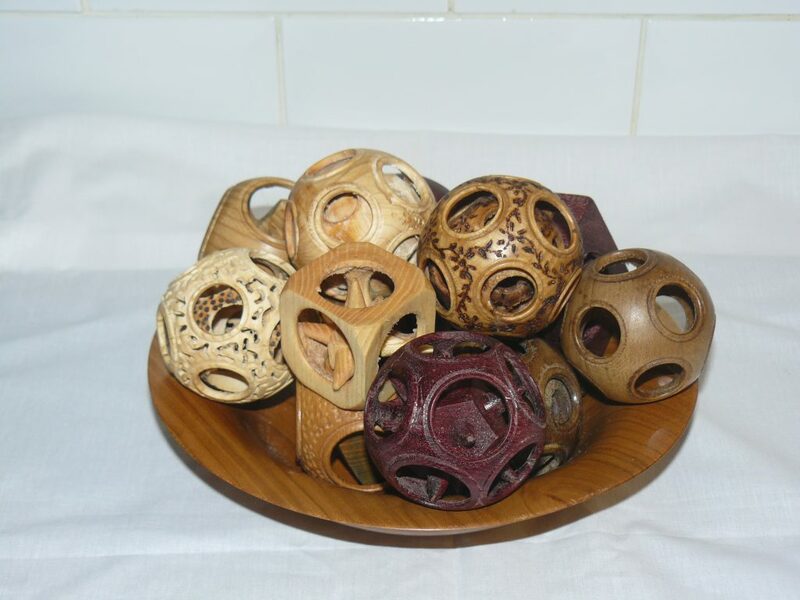 I purchased some 63mm wooden balls on Ebay and found them to be quite successful. I think they are birch but I can’t be sure. However I decided I would try an experiment. A while ago I acquired a load of Yew. Unfortunately because of the size of This Yew Tree, The tree surgeon had to cut much of it into very short logs so that he could lift it. Many of These logs were only 6 – 8 inches in length. I cut one of them into blocks and decided to try using one of these blocks. I turned a sphere and quite easily made a four level ball. I discovered that as long as I kept the cutters sharp and ﬁnished the four level ball in one afternoon then I was able to do it without the ball distorting before it was ﬁnished. I have found this journey fascinating and will continue to expand my knowledge of these Chinese balls. Trying different woods and methods until I become more proficient. As I have continued to work on these turnings I have changed some things since the above article was written and there have been some changes outwith my control. Joe Skehan has still not uploaded any more tutorials to his site, however the level 1 tutorial at http://www.magicalwoodproducts.com/ is still a great place to start. I have stopped using the forstner bits for the holes and now use a ground down tapered drill to create the holes. I have found plumbers fittings which work well for holding the balls in place. They are high pressure fittings which are used for swimming pools like these available here http://www.koilogic.co.uk/pvc-high-pressure-socket-union-plainplain/p198 , I used the 3 inch fitting. This entry was posted in Uncategorized on March 15, 2019 by alexfrancis.